Over the last couple of months, I’ve seen several articles with the common theme that being a pro wrestler isn’t easy. Usually the people making these statements are fans that went to a “fantasy camp”, or a similar situation where they paid a few bucks to train for a weekend that culminated in an undoubtedly crappy wrestling match against one of the other trainees. They’ll tell you with obvious disbelief that it is much harder than sitting in their Lay-Z-Boy watching it on TV each week. But what about the opinions of people that have a physically job that is obviously not easy? Let’s look at a couple of MMA fighter-turned-pro wrestlers that have recently commented..
From Wikipedia: Muhammed Lawal an American mixed martial artist and professional wrestler. He is signed with Bellator Fighting Championships as an MMA fighter, and Total Nonstop Action Wrestling (TNA) as a wrestler. He is the former Strikeforce Light Heavyweight Champion. Nicknamed King Mo, he is a former three-time U.S. Senior National Wrestling Champion. He wrestled at the University of Central Oklahoma for three years (’00, ’01, ’02), winning one NCAA division II national championship in 2002, and compiling an overall record of 103-22. […] pro wrestling training is harder than MMA training. Just look at the gruesome injuries you see in pro wrestling as opposed to MMA. That sh*t is real, man. You don’t see many compound fractures in MMA like you do in pro wrestling. All you gotta do is YouTube Sid Vicious leg break. Man, you see all kinds of crazy sh*t in pro wrestling. [He] was asked to vault over the ropes and stick a landing. It was easily a 10-foot drop. Seven people tried it before him, and all of them got hurt. He flatly refused. Another day, an instructor demonstrated a fall – on concrete. Lawal was shocked at the loudness of his body hitting the ground. It didn’t take him long to realize he had a long way to go. From Wikipedia: Daniel “Dan” DeWayne Severn is a retired American mixed martial artist and professional wrestler, notable for his success in the early years of Ultimate Fighting Championship tournaments. Severn has fought and wrestled for many mixed martial arts and professional wrestling promotions, including King of the Cage, PRIDE FC, Cage Rage, WEC, RINGS, MFC, the IFC and the World Wrestling Federation. He holds a professional MMA Record of 101–19–7 and is a UFC Hall of Famer and a former UFC Superfight Champion. In professional wrestling Severn is a two-time world champion, having won the NWA World Heavyweight Championship twice. As of January 2013, at age 54+, Severn still competes in professional wrestling. In amateur wrestling, Severn was an All American at Arizona State University and a U.S. Olympic Team alternate. On the brink of his retirement from action, Dan “The Beast” Severn is looking back at his long and successful careers in mixed martial arts and pro wrestling. His unique insight on those pursuits might surprise people who view them through the simple real-versus-fake dichotomy. Severn quickly discovered that wrestling, though scripted, wasn’t nearly as “fake” as widely believed. What makes it even trickier, he says, is the peculiar nature of most professional wrestlers. Now, I’ll admit that when these guys say it’s hard they aren’t just talking about the physical abuse. What they’re also talking about, but don’t specifically say, is that a match should have a good beginning, a solid middle, and build to a satisfying end. Accomplishing that while still concentrating on the physical is probably the hardest part. So when they say it’s hard, it’s probably similar to a veteran NFL player, who is used to years of getting pummelled on the field, saying that “Dancing with the Stars” is hard. It’s just different. In any case, it’s definitely the hardest thing that I’ve ever done, so it’s nice to hear some legit tough guys say the same. I haven’t been watching televised wrestling for quite awhile. As in months. Sure, I peruse some wrestling news stories daily (mostly just the headlines) and my TiVo faithfully records WWE Monday Night Raw, WWE Smackdown, and TNA Impact each week in the hopes that I’ll actually play one of them back some day. But the little guy just ends up disappointed. NASHVILLE, TN (May 30, 2012) – TNA IMPACT WRESTLING announced today that the highly-rated weekly series will be making changes to its programming to include a hybrid of reality and explosive action each Thursday, live on SPIKE TV at 8:00pm/ ET. The reality elements and production technique represent the most significant evolution in this genre in more than 15 years. Given the changes described above, I thought last week’s show would be a good point to take a look and see what’s changed. From what I’ve seen so far, not too much. In my absence, I do miss seeing guys like fellow wrestling camp graduate Austin Aries have great matches each week, but that’s maybe 10 minutes of two hours of your life you can’t get back (less without the commercials- thanks TiVo). The behind the scenes “exposure”, at least in the first week, was a critique of a match I didn’t see, and in a way that has already been done on the previous WWE Tough Enough programming. The cameras backstage caught some scripted “unscripted” moments from a couple of the wrestlers, but it was far from “pulling back the curtain.” At best the curtain rippled a bit like it would from a gentle breeze. Looking back at the press release, I see that they called it an “evolution” rather than a “revolution”. I didn’t catch that the first time. Evolutions take around 100,000 years. I think I’ll check in on them in another 6 months and see if they’ve had any mutations. TNA changed their name to IMPACT WRESTLING (all caps) so that they could say the word “wrestling” as much as possible. Then they got a bunch of drunk people to comment on why they like wrestling, so that they could air it at various points in the show. Actually, I don’t know that they serve beer at Universal Studios, but I would think you would at least want the guy to act drunk if he’s portraying a wrasslin‘ fan, right? This is in direct response to the WWE, who I like to call “The Company Formerly Known as World Wrestling Entertainment” (TCFKAWWE), after they made it clear that they do not want to be referred to as a wrestling company (WWE “No Wrestling” Policy). Impact Wrestling (sorry, I won’t type all caps) is trying to capitalize on negative feelings from wrestling fans about the recent policies of the WWE. Will this cause people to start watching Impact? They aren’t in head-to-head competition, so I don’t see the ratings improving because of this alone, especially once the new viewers experience the end product. If someone gets fed up with the WWE, will they turn on Impact instead, or just play video games or any other activity you could do during those two hours? Is TNA/Impact being genuine about their passion for wrestling, or is this just a publicity stunt? While I think the passion for “wrestling” is genuine from the workers, the company still does a lot of stupid crap in the booking department that gives wrestling a bad name. I can say personally that my interest in watching the national promotions goes in cycles. For a few years I was watching all programs of WWE and TNA (and keeping track of them: TV Match Ratings, TV Viewership Stats). For the last 3 months or so, I’ve watched almost nothing. The one thing that has held my attention is WWE Tough Enough. I’m not a fan of “reality” TV at all, but I’m always interested in a program like this to see how much they reveal about the wrestling business. It turns out not a lot, but enough to hold my interest and give me a little more wiggle room in what I write about on this site (more on that in a later post). Impact gets a pat on the back from me for standing up and saying that there’s nothing wrong with having a wrestling company that still calls it wrestling. But if they aren’t going to make good use of the talent they have, I will not be a frequent viewer no matter what they call it. I don’t spend too much time reading the wrestling sheets or sites. Partly because I actually want to be surprised when something happens on-air, and partly because there is just so much activity out there between “news” sites and blogs that it’s hard to separate the signal from the noise. So it’s probably mostly luck that I stumbled across an opinion piece by Mark Madden on the WrestleZone site that touched on something I had meant to ask a year ago. Everyone is RAVING about the Piper’s Pit segment on Raw, citing [it] as evidence that old-school characters like Roddy Piper have it all over today’s crap performers. Oh, Piper was BRILLIANT. He added more value to the WWE title by talking about it than any champion of the past 10 years has done by wearing it. He led John Cena and Wade Barrett around like dogs on leashes, and to great effect. But the reason that segment sparkled was because Roddy’s lines weren’t scripted. He [knew] what to advance, and he advanced it within the context of the Roddy Piper character, which he knows much better than anybody else who could ever write words for that character. I beat this drum A LOT, but it’s a drum that needs beaten. WWE (and TNA) do things that are NOT a matter of opinion, NOT thinking outside the box, NOT a reasonable alternative. They’re just WRONG. Scripting promos word-for-word is WRONG. It sounds like everyone’s speaking in the same voice. I haven’t read any detailed reports about the level that the interviews and segments are scripted in WWE. I remember reading what was supposedly a “leaked” Monday Night Raw script, but I wasn’t convinced it was actually real. It looked realistic format-wise, but I have a hard time believing that anybody would be able to memorize a 10 minute promo the day of the event and not screw it up. I am also guilty of fast-forwarding through just about all the interviews on every wrestling program, so I would only be giving an opinion on the small number that I have heard (Piper’s segment was one of them). But for the sake of discussion, lets assume that the “creative” team actually writes out the dialog for every interview. Why would they do this? I can see where they have some bullet points or guidance to provide because they have the angles and feuds mapped out probably 6 to 9 months in advance. 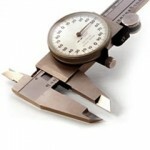 They know when all the Pay-Per-Views are scheduled and they are trying to set the road map for the company. But why would they actually write out the complete dialog for someone to memorize word-for-word? If you’ve ever read anything about the Larry David show “Curb Your Enthusiasm” or any similar improv-style program, you know that they just have an outline and a general direction and the rest is improvised. That sounds like the perfect model for wrestling. It works as long as you’ve got guys that can talk, and wrestling has that. The workers are going to have better ideas about the words they should choose and the personality of their character than some ex-sitcom hacks that the WWE hired. Maybe “creative” should worry less about the intricate details of the promos, and spend more time preventing stupid decisions like making Vladymir Kozlov and Ezekiel Jackson babyfaces, keeping Kane employed, and having Microsoft Outlook be the WWE general manager. Around the same time, Pro Wrestling Illustrated released their yearly PWI Top 500 wrestlers list. Regardless of what you think of their ranking system (I don’t remember how much effect reader ballots have on the rankings vs. PWI staff voting), I thought it would be interesting to match up my list with theirs to see how they compared. Below are the same rankings I originally published, with the addition of the PWI top 500 ranking. Coincidently, the PWI rankings span the same months as my data collection (July through June). For TNA, there is only one program available that I was tracking (TNA Impact). Just what I expected… absolutely no correlation between my rankings and the PWI 500 (except for A.J. Styles in TNA). You can see all the details about the rankings on the Wrestler Match Ratings page. From July 2009 through June of 2010, I collected some stats on the WWE Monday Night Raw, WWE Smackdown, and TNA wrestling products (and ECW until their shutdown on 2/19/2010). I was measuring the quality of the matches on each program by giving each one a “Thumb” rating. A great match gets one Thumb Up, an outstanding “match-of-the-year” candidate gets two Thumbs Up, and everything else gets zero (I was also giving Thumbs Down– more on that later). When I recorded the Thumb Rating, I also happened to write down the names of the wrestlers that were involved in the matches. Since I had the data, I decided to total these up for each wrestler involved. All participants in the match got the same number of points. You can read all the details and a bit of analysis on the Wrestler Match Ratings page, including a link to the spreadsheet so you can see the numbers for yourself. I’m providing a quick summary below. For the WWE, I used the combined data from the Raw, Smackdown, and ECW programming to calculate the rankings. I assigned one point per Thumb, so the scoring should be obvious. Take a look at all the details on the Wrestler Match Ratings page. I tracked all four shows for a year before deciding to change things up and measure them differently (you can find the results of the that year-long experiment, including the charts and data, on the TV Viewership Stats page). In July of 2009, I started collecting some different data about the same wrestling programming. What I was measuring this time was the number of matches per hour, and the quality of those matches as judged by a simple rating system. The rating system I used was not one to five stars. It was closer to how I rate programming using my TiVo (Thumbs Up/2 Thumbs Up/Thumbs Down). Since the WWE decided to shut down the ECW promotion, I stopped reporting on ECW and just did the other three. After 52 weeks of collecting data from July 7th 2009 to July 9th 2010, here is a summary of the rating results. If you want to see more details, take a look at the TV Match Ratings page. For each of the three brands, the thumb ratings have been totaled since I started collecting data the week of July 7th, 2009. Just to be clear, each “One Thumb Up” rating counts as one point, each “Two Thumbs Up” rating counts as two, and each “Thumb Down” rating counts as negative one (which subtracts from the total). Despite all of the negative press it gets, TNA pulled out ahead of Smackdown and way ahead of Raw in the quality of the matches (in my opinion). TNA would have been even farther ahead on positive ratings, except that they have had so many bad matches since Hogan and company showed up that it pulled their total down (remember a really bad match gets a Thumbs Down which reduces the total by one). One other thing of note was the average ratings per match over time for each brand. The Raw guest host format has certainly affected the WWE programming. They are consistently at the bottom, even though it is supposedly the WWE’s “flagship” program. About 1 in 20 Raw matches is considered great. If you take a look at the trend of TNA, you can see the damage Hulk Hogan and his cronies inflicted after the first of the year (about the midpoint of the charts). 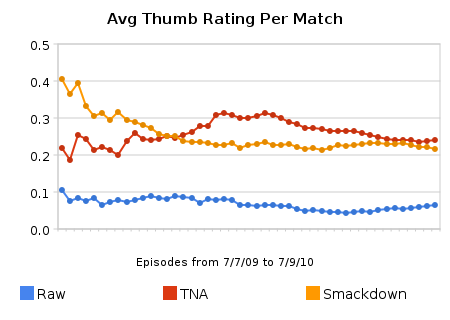 The average rating of each TNA match was climbing until Hogan took over. At its peak about 1 in 3 matches was great. It has been steadily falling since then, up until the last few weeks where it leveled out. Smackdown has been fairly consistent over time, equaling TNA in the last couple of months. About 1 in 5 matches are considered great.